Chrysler's "B" and "RB" engine crankshafts have two basic stroke dimensions. 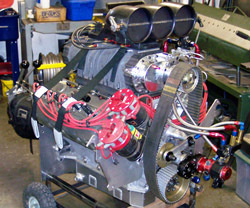 The "B" engine crankshaft uses a 3.380 inch stroke and the "RB" engine uses a 3.750 inch stroke. Main journal size also differs between the "B" and "RB" engines. The "B" engine uses a 2.625 inch main journals, the "RB" uses 2.750 journals. Both engines share the same 2.380 inch rod journals. All early crankshafts are steel forgings. In 1971 Chrysler used a cast crank in low performance 383 engines. The use of cast crankshafts in 440's began in 1972. All cast cranks and certain forged steel cranks are externally balanced. These require the use of specially balanced harmonic dampeners, torque converters and flywheels. The appropriate components must be used to ensure that the reciprocating assembly is in balance. If an internally balanced crank is used with an external balanced converter or dampener (or vise- versa) a severe out of balance condition will occur. Externally balanced crankshafts can be internally balanced by adding a heavy metal called Mallory metal to the crank throws. 440's equipped with 3x2 barrel carbs were also externally balanced to compensate for heavier rods. They require the use of externally balanced dampeners and converters or flywheels. 72 and up B&RB dampers use a different pulley bolt pattern.